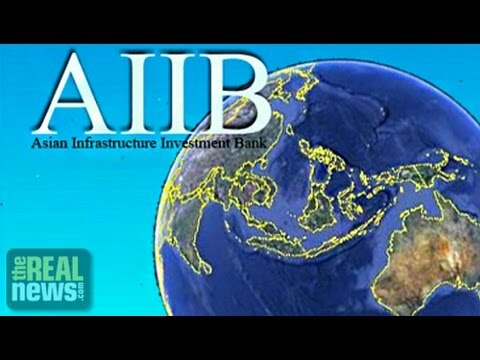 This is segment two with Michael Hudson on the Asian Infrastructure Investment Bank, a new rival to the World Bank. In segment one we talked about the history of the World Bank and the problems that it has posed in terms of its policies to the developing world and why it is necessary to develop another investment bank of this nature. So Michael is joining us to continue this discussion. And as you know, Michael Hudson is a regular guest on The Real News Network. Michael is a distinguished research professor of economics at the University of Missouri-Kansas City. Given the subject matter we’re dealing with today, you may be interested in his book, called Super Imperialism, specifically the chapter on the World Bank. Thank you again for joining us, Michael. MICHAEL HUDSON, PROF. ECONOMICS, UMKC: Good to be here. PERIES: So, Michael, let’s take up this question of why the European countries are eager to join the China-led bank and what tension this is causing with the United States. HUDSON: Well, I suspect their motivation for joining is hoping to get some role in some of the development contracts in the big construction projects that are being done. They are going to have a minority share, just as they have in the World Bank. The problem is that in the World Bank, the U.S. has a veto power and has vetoed any project that does not reflect U.S. national interests. Well, you can be pretty sure that China is going to maintain a similar veto power in the bank that it’s creating, and maybe some of its allies will also have a dominant power there. And so the European countries will come in as minority investors. Just like there’s a managing partner in a partnership that actually conducts things and the other partners simply follow along, China is going to be the managing partner in this bank as the counterpart to the U.S.’s managing partner in the World Bank–so the Europeans are hoping in participating in this. Now, what China gains by having them as members is the fact that now that this is a multilateral supranational organization, it will be very hard for countries that borrow from the bank to undertake their own development projects to then write down the loans. They can’t treat this bank in the way that they would treat private bondholders. This bank will be treated in the same way that the IMF or the World Bank or the European Central Bank is. Its loans will be immune from the haircuts and the write-downs that you’re having elsewhere. So this is China’s way–by bringing in the European countries, this is China’s way of protecting its own investments and its own loans to these countries without really risking a chance that England can play the role of a wrecker, which, of course, is what the United States would like it to do and why the United States pushed it into the common market originally. PERIES: And, Michael, this also puts the whole issue of the U.S. dollar as a universal currency in question. Obviously, the Chinese are also interested in making sure the yuan/renminbi is also a part of these, part of what benefits from this relationship with these countries. HUDSON: Well, the U.S. is using the dollar as a Cold War weapon. As I mentioned in the previous section, it’s been urging countries that owe money to Russia not to pay. [incompr.] Russia, the Ukraine, to treat the Russian debt as if it were foreign aid and didn’t have to be repaid, and as if somehow it were an odious debt. That was proposed by the U.S. banking interests. China, if it can succeed with the other BRICS, with Russia, Brazil, and other countries, in creating an alternative area, it can turn the tables on the U.S. It can say, the debts to the World Bank are odious debts. They claimed to be foreign aid. They were counted in the United States budget as foreign aid. But they weren’t aid at all. They underdeveloped the countries. They made them import-dependent. They blocked their ability to produce their own food. So if China and the BRICS can achieve a critical mass as an alternative to the dollar, they can then treat the dollar in the way and that the U.S. financial strategists have been trying to treat it against any potential Cold War enemy, which means any country north of Maine, any country west of California, any country east of Rhode Island or south of Texas. The United States has turned the finance system, the dollarized system, into a Cold War tool, and other countries are moving as quick as they can, are being driven to move as quick as they can out of the U.S. orbit to protect themselves from being stiffed by the U.S. and to be free of U.S. financial aggression, in which the World Bank, is even more than the IMF, the most aggressive neoliberal, neocon institution. PERIES: Michael, you mentioned odious debt. Now, wouldn’t this be opening the floodgates to a lot of other issues of other countries that might also use that argument against the current World Bank if they’re actually advising people to do this? HUDSON: That’s exactly what Anne Gilpern pointed out in her discussion of U.S. strategy against Russia in one of her articles for the U.S. banking lobbies, saying, look, this very dangerous. If you claim that other countries have odious debt for trying to develop, you’re saying if other countries try to develop, that’s odious? If other countries try to be free of the U.S. Cold War, that’s odious? They can turn the tables on you, and the United States is going to end up isolated. And so the United States is obviously rethinking exactly how it’s going to help the Ukraine not pay Russia the money it owes, how it’s going to help Sri Lanka not pay China the money it owes, how it’s going to pressure other countries to sort of default on their debts to anyone that the United States says is not in our friendly side of the Cold War. PERIES: Michael, as always, I thank you so much for joining us today. HUDSON: It’s very good to be here. Thank you.